Use for wood siding, trim or many other projects. Lengths from 1-1/4" to 4". Type 304 stainless steel siding nails by Simpson Strong Tie will protect your cedar from stains and streaks. The high-tensile nicke/chromium stainless steel will last the life of the wood without any degradation. They feature a slender guage and blunt diamond point to minimize splitting. The under fillet of the head allows the nail to be driven flush or countersunk without crushing the surrounding wood. Checker patterns on the nail head diffract sunlight and blend in with the texture of the wood. The annular rings on the nail shank will limit cupping and prevent nail pops. For seaside applications it is recommended to use Type 316 nails. 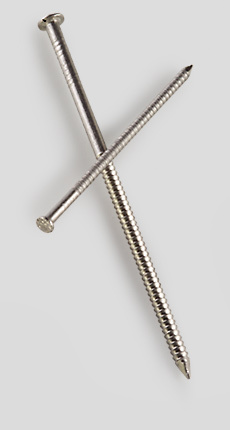 For a quote click on type 316 stainless steel siding nails. 2", 2-1/2" and 3" siding nails are also available painted in cedar, dark brown, gray, redwood and white to blend in with most wood siding and PVC trim. For a quote click on painted stainless steel siding nails.